Cho Ramaswamy, political analyst and editor of the Tamil magazine Thuglak, was said to be the only man in Tamil Nadu who spoke openly and courageously against the Emergency. In this interview with Shobha Warrier, he recalls those dark days, most of the time satirically. It is always a pleasure talking to him and listening to him airing contrarian views. How did you take the news of the declaration of the Emergency? Did you have a feeling that it was coming? Mine was the only journal in the country that wrote that there could be an Emergency regime. 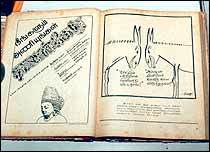 We even published a mock cartoon, which showed JP, Kripalani, Morarji and many others in jail. In this imaginary piece, we said that all fundamental rights had been taken away. Of course, we exaggerated the prevailing situation before the Emergency. What gave you the idea that the Emergency would be declared? We never had anything like that in India till then? I had been interacting with many people like Chandrasekhar. The way things were going, I thought Mrs. (Indira) Gandhi might feel she was fighting a losing game mainly because of what was happening due to the JP movement. Of course, for her, the last straw was the Allahabad high court judgment. Once the Emergency was declared, did you feel vindicated? It's not a question of vindication. When VP Singh became the prime minister, I said the very same Devi Lal who propped him up could dump him and back Chandrasekhar quite soon. It happened. It was not premonition. I can give you a list of things, which we had predicted. I asked Mrs. Gandhi in an interview, 'How long do you think Bangladesh will remain friendly?' I said it's going to be a problem for her. She asked, 'Why do you say so?' I said that was how I felt. She didn't agree. She said it was exaggerated. When the Liberation Tigers of Tamil Eelam set foot in India, I wrote it was going to be a menace as far as Tamil Nadu was concerned, and that we must sit up and take notice. I started campaigning against it. Everybody thought I was exaggerating a non-existent threat. Everybody thought I was anti-Tamil but ultimately it proved to be true. When the Janata government came to power, I said Charan Singh was going to be a threat. When Sanjiva Reddy was elected President, I said he would be a problem to the government. 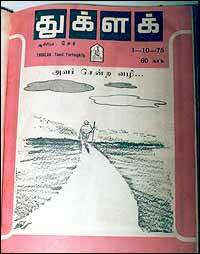 When the Emergency was declared, you were the editor of Thuglak. What were the problems you faced? I was agitated initially and stopped the publication of Thuglak for two issues. Later, when I restarted, I published a black wrapper. 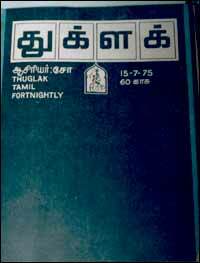 In fact, two issues of Thuglak had black wrappers; one was during the Emergency and the other after Babri Masjid was pulled down. Why did you restart after two issues? I wanted some time to think and see how I could tackle it. I was busy writing for underground magazines, and also addressing meetings. The Rashtriya Swayamsevak Sangh mostly did these underground magazines.� That is how I came into contact with them. They were very dedicated people publishing magazines against all odds. Then, I started interacting with Ramnath Goenka. I had nothing to lose at that time but not Goenka. I used to say, I don't even have hair on my head to lose!! Goenka had an empire at stake. So also Irani. In spite of it, they spoke against the Emergency. Their courage is much greater than mine because I was a man with nothing to lose. At any point of time, were you scared? Somehow, my safety didn't bother me much. I am a fatalist. I strongly believe that when my time comes, nobody could do anything to make me live longer.� Otherwise, even if you want to kill me, you will not be able to do so (laughs). I restarted the magazine when I felt I could convey some messages to the people. There was an old Tamil movie called Sarvadhikari (Dictator) made in the fifties. I reviewed the movie during the Emergency. Luckily, it was showing in a theatre at the time. In the review, I condemned the dictatorship. A woman was behind it too! There were so many indirect ways to criticise the Emergency. Didn't you have any problems with the censors? I was a regular visitor, with my magazine, to Sastri Bhavan, where the censors sat. I even took my salary to him telling, "This belongs to you. You are the editor!" They were embarrassed all the time. They were helpless. The governor's advisors warned me. I said I was not bothered. Every issue was a problem. But I addressed meetings though meetings were banned. The Congress (O) was sponsoring meetings. Please don't forget that I was not the only one who fought; there were many others. Rajmohan Gandhi fought it through Himmat. Goenka fought it. Irani did. But all the time I knew the Emergency would be lifted sooner than later. I was saying that in all the meetings as it was becoming difficult to manage. How was the general atmosphere in Tamil Nadu? Were there any excesses? Karunanidhi was undecided. He went on praising Mrs. Gandhi now and then. Before he was dismissed, he supported the 20-point program, he supported Sanjay Gandhi's 5-point program. He thought he could escape by supporting her. He went to the extent of saying I am not your enemy. In fact, I am prepared to identify and give you information about people who are against you. MGR kept warning me in his speeches that I would be arrested any time. But I was not arrested. Why do you think they spared you even after your attacking (though indirectly) through the Thuglak? It could have been my proximity to Kamaraj. The second reason could be that my father was a respected Congressman. Third, perhaps they thought "He is after all a satirist, let him say whatever he wants in an indirect fashion!" Rajmohan (Gandhi) was not arrested. Goenka was not arrested. Irani was not arrested. All of them were working against the Emergency. Were you at the receiving end of any direct or indirect threats? Yes. People who were close to Sanjay Gandhi were asking him to do something about me. Certain industrialist friends of mine used to warn me. But nothing happened. I cannot say I went through hell and all that. Were you getting a kind of pleasure by attacking the Emergency? A sense of adventure? I think it must have been some kind of a thrill because I was only a five-year-old journalist then. My journal was launched in 1970. In hindsight, I feel I must have been thrilled fighting a mighty power. It could be that. You said when the Emergency was lifted you were expecting it. Did you feel relieved when it was finally lifted? It was no great relief or pain or anything. I took it in my stride, that's all. But I campaigned for the Janata all over India, attending meetings wherever Tamils lived. �What was the mood of the general public when the Emergency was lifted? In Tamil Nadu, the Emergency was not unpopular. People actually welcomed it. There was no great abuse of power here. Maybe, because MGR did not oppose it. I have a feeling that the middle class throughout the country welcomed it. To be honest with you, I attended a BJP meeting a few days ago. I said, the Emergency was then brought about by a wrong person for wrong reason at a wrong time and administered wrongly. There was no threat of war, no internal disturbance. All that happened was that there was JP's movement against corruption and the Allahabad high court unseated Mrs. Gandhi. Now, you take the condition of the country. Naxalite groups are operating in several parts, and they are growing. The LTTE has not stopped its anti-India machinations. Khalistan movement has not been stopped totally. Infiltration of Bangladeshi refugees is going to be a big problem for the country. Look at the condition in the North-East and Kashmir. And, workers go on strike for anything. During the Emergency, nobody even spoke of a strike. Every reform is being blocked now. So, this is the right time for an Emergency. No, I am not. Today, nobody is aware of his duties in this country. Laws are there to be broken. Rules are there to be violated. Regulations are there to be ignored. That's the present mood of the country. Why is China advancing at a more rapid rate than us? It is the discipline, which is helping them. We are the most indisciplined of all democracies in the world. Those who were part of JP's movement against corruption are symbols of corruption now, like Laloo Prasad Yadav. So, the time is right but the person over there is wrong again. By wrong person, I mean Sonia Gandhi, who is the real authority, the real power. So, there is a wrong person there. One can rest assured that it will be wrongly administrated. I will not welcome an Emergency if this government imposes it. But if a person like Vajpayee or Advani, real nationalists- not necessarily them but someone like them- does it at some point of time, I will welcome it. That's my present mood. I want to be honest when I give my opinion. Sub: What he says is alwasy right! Sub: No time for emergency!